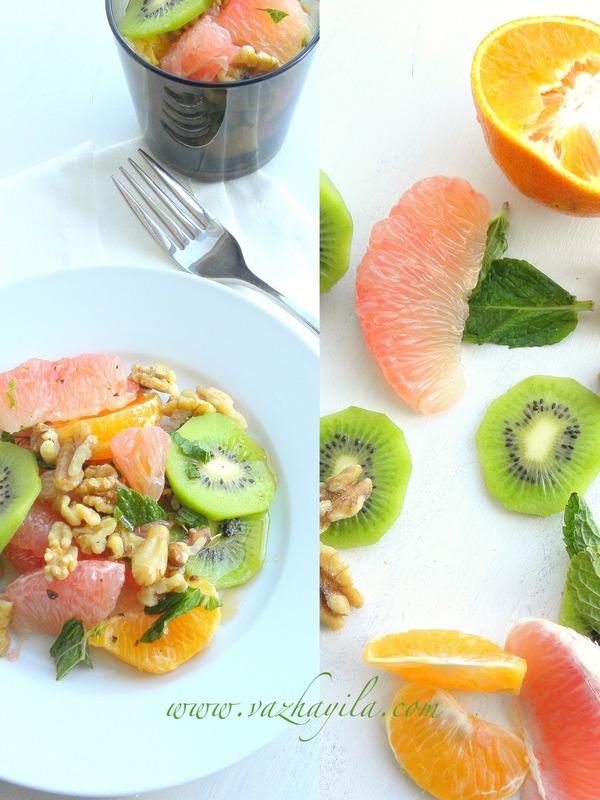 A simple citrus-y fruit salad to stay healthy in this winter. The recipe is adapted from Martha Stewarts' and I added some Pepper and maple syrup to improve the taste. Its so easy to put together and makes you feel so good, I already made it a dozen times . Its great to get hold of recipes , which is healthy and at the same time tasty. I am a person who always had a tough time associating healthy with tasty till my life moved to US. Now I have many recipes which incorporates both the concept , and helps me voyage through "a diet" when i have to loose some extra pounds ;) . This salad is so full of Vitamin C and cold fighting antioxidants , thus making you armed for any flu attack this season. I normally have this for breakfast or dinner and it has such a soothing effect and totally relax your mind and body :) . In a bowl toss the fruits with a pinch of salt and pepper . Add chopped walnuts and chopped mint leaves. Arrange a serving size on a plate and drizzle some maple syrup or honey over the fruits. Healthy and flavourful salad Sarah,Beautiful presentation as always. Looks coloful and fresh salad..loved it. adipoli salad. entha color. love it. looks beautiful....all citrusi and yummy! looks fresh and beautiful with those vibrant colours.. Very healthy salad,loved the beautiful colors of nature. What a beautiful salad! looks fantastic! Sarah...there is freshness served on a plate.as if its summer during winter time. Happy Christmas sarah, just in case I dont get a chance to wish you. refreshment zone...i loved as u put kiwi pieces in that n ofcourse adding honey will gve a extra ordinary lick to the salad...awsome my dear..